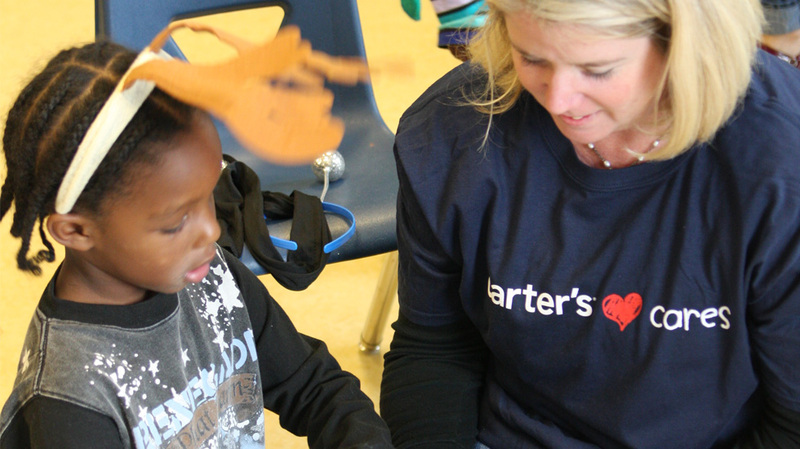 Carter’s creates lasting partnerships with child-focused organizations. More than 10 years ago, Genevieve Piturro walked into a Harlem children’s center. She brought with her twelve pairs of new pajamas. When one of the little girls asked her, “What are these?” Genevieve decided to begin Pajama Program. Today, Pajama Program is a national 501(c) (3) organization that provides new pajamas and books to children in need, many waiting and hoping to be adopted. The organization recently launched the nationwide One Million Good Nights initiative to collect one million new pajamas and books for children in need by the end 2015. Snuggling up in cozy new pajamas with their very own new book gives these children a secure and nurturing ‘Good Night’ at bedtime. At Carter’s, we believe all children deserve to feel warm and loved at bedtime. Because we make and sell more children’s pajamas than any other children’s apparel manufacturer, it just makes sense that providing children in need with pajamas is our signature cause. 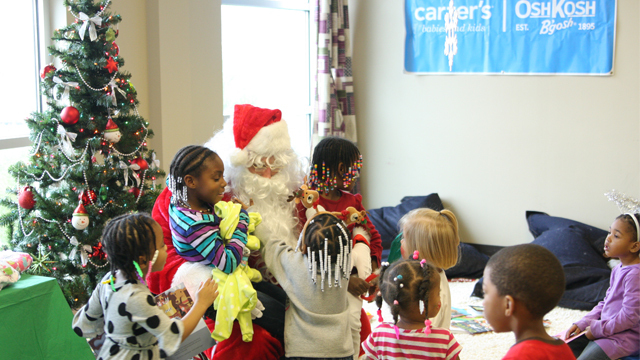 For the past four years, Carter’s has been proud to partner with Pajama Program to help children in need. Last year during our donation drive Carter’s and our customers donated 100,000 pairs of comfortable pajamas. Our customers also donated $375,000 to the program online and in our retail stores in 2012. 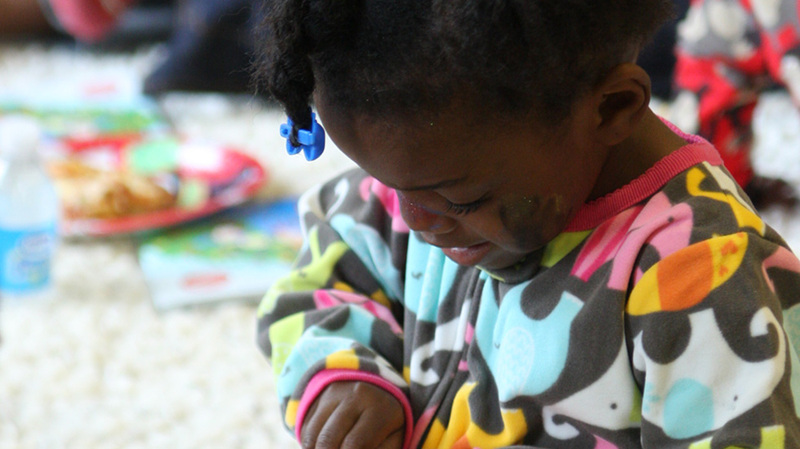 Together, we’re helping to give these children a better bedtime as they snuggle up in their new, warm pajamas and read their very own books until they’re ready to drift off into sweet dreams. Here are just some of the ways the support of the Carter’s Community is making an impact. Santa delivers more than toys! Have a question that isn't answered on this page? Check out our FAQ. My Sister’s House is an overnight shelter that has provided help and refuge for women and children in distressed domestic situations since 1983. 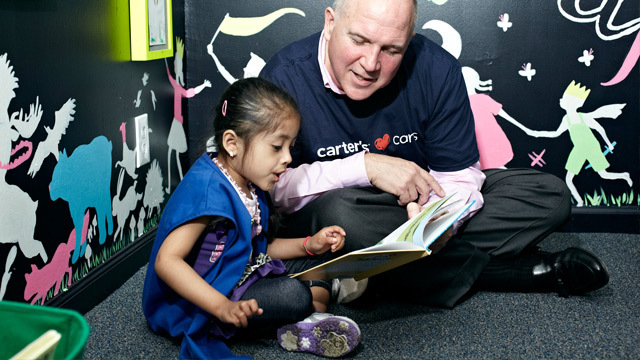 Because we believe that every child deserves a good night, Carter’s employees brought pajamas and books to the children who enjoyed being read to. 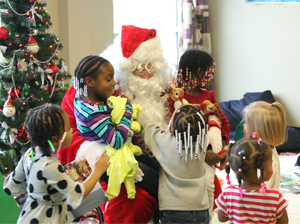 As they tried on their new pajamas, special guest, Santa Claus, was there to bring good cheer and remind the children about the importance of reading regularly at bedtime. 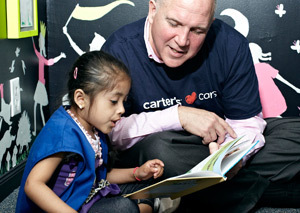 Our customers have also joined Carter’s to help Pajama Program bring a better bedtime to children everywhere. 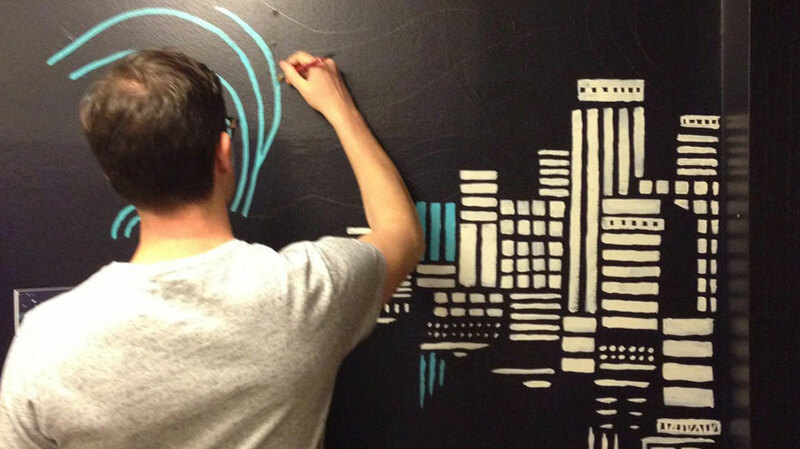 Last winter, our generous customers donated over $375,000 through in-store and online donations. 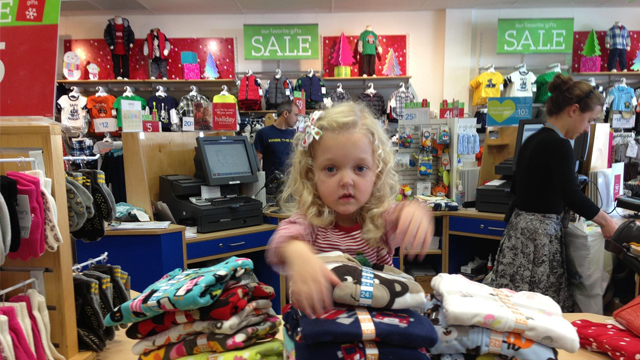 Customers also donated new pajamas in Carter’s stores like our friend Lilly. 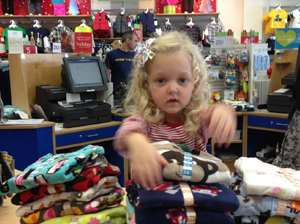 After she saw our in-store donation box, she and her parents were inspired to donate 16 pairs of pajamas. We’re proud to have such caring customers. This year, we are joining Pajama Program in their One Million Good Nights Campaign. We hope you will join us as we strive to reach our goal of providing one million good nights to children in need by 2015. Our New York based Design team designed and painted the Carter’s Children’s Gallery in the new Pajama Program Reading Center in New York. The designers chose a fairy-tale theme for the whimsical room and Carter’s employees and even the CEO, were on hand to help celebrate the opening of the new Pajama Program Reading Center with a Pajama Party for local pre-schoolers.